Experience the ultimate in convenience! 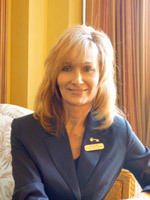 Ashland Springs Hotel is proud to introduce you to our CONCIERGE, Donna “Gigi” LaRossa. Gigi started working at the hotel in December 2009 and has been an indispensable asset to our team. Her years of experience in the travel industry and an incredible knowledge of Southern Oregon give our guests an invaluable source of information about anything and everything in and around Ashland. She is here to enhance our guests’ experience, keeping their enjoyment, satisfaction and safety in mind. The concierge holds the key to the city. She is motivated by a genuine desire to serve and is committed to providing the best possible service to our visitors throughout their stay. Gigi advises our guests on restaurants, theater and outdoor attractions, sightseeing & wine tasting tours, shopping and travel emergencies; from giving simple directions, to solving unexpected challenges. She is here to assist in creating lasting memories. She is a trusted resource for both business and vacation travelers. It is her goal to assist in making sure our guests get the optimum Ashland experience. If you are planning to visit Ashland and staying with us do not hesitate to contact Gigi in advance and allow her the opportunity to help you plan your trip. “Months late but I wanted to thank you for the great kindness you showed me when my husband and I took refuge in the lobby after the death of our son. We were in such shock. You settled us and gave us coffee, most importantly, allowed us space to grieve in that cocooning, comforting place. Bless you. Thank you. “Thank you for all of your help with planning our transportation and day trip. It worked out great. Everyone enjoyed time in Ashland. Great meeting you and thank you again for everything. “Your tireless effort trying to find a spa package for myself and my husband made a lasting impression on me. Thank you for going the extra mile. Our stay was so pleasant and our walk down the street in snow was very romantic. “Thank you for the wonderful hospitality for our 12th Anniversary “Staycation”. We all had a wonderful time and just wanted to let you know how much we enjoy your expertise at the Ashland Springs Hotel. We’re looking forward to our next visit and Henry the Vth on the 27th! “Thank you for being such a Shining Star in our little community! You have helped so many local businesses, and I look forward to working with you in the future! “I am most appreciate of all the suggestions, recommendations and work you have done on my behalf during twelve night stay at the Ashland Springs Hotel. You are gracious and always eager to help. You seem to love your work. Many thanks for everything you have done for me. “Thank you so much for caring for the two of us during our stay. You are wonderful and we so enjoyed you! You helped make our stay here so memorable! “You made the hotel visit complete! “Here I am in my office. Thinking to my trip. I really thank you for your help and your pleasantness. I wish you a nice day and see you the next year in February with new adventures!?? “What can I say – you were fabulous in every way! Thank you so much for all your suggestions, your time and the fun! Andrea and I both enjoyed working with you so much. You were a big part of making our board retreat a big success. Best concierge ever: I want to tip my hat to Donna “Gigi” LaRossa, the Concierge at the Ashland Springs Hotel. While everyone we met in Ashland, from the hotel personnel to our waiters and waitresses to the ushers at the Shakespeare Festival, was charming, friendly and helpful, Gigi really outshone them all. So amazingly concerned and kind and knowledgeable about everything Ashland. She really exemplified the very best of the hospitality industry, and did everything she could to help us make the most out of our stay. The Ashland Springs Hotel is lucky to have such a dedicated professional on their staff, and we are grateful we met her – she helped us plan our trip and made our stay in Ashland run smoothly (not always easy when traveling with a 91-year-old in a wheelchair). Gigi is a real delight, and I highly recommend consulting her when staying at the Ashland Springs. Wanted to pass onto you how wonderful my daughter’s and my experience was paragliding this past Saturday!! I tell you what – we were flying with ROCKSTAR pilots in Christian and Nick ( I believe I have that second name right). They were wonderful and the experience was something I will never forget!!! I would most highly recommend both of them to any of your clients!!! Christian is not a man of words on the phone, but let me tell you – he knows his stuff in the air!!!! I cannot commend them more – top rate and gave us a life-altering experience!! Thanks for all your help while we were staying at Ashland Springs – top rate hotel with top rate personnel. My husband and I were guests at your hotel last week. We were really impressed with the excellent service provided to us by Gigi, your Concierge. She offered us wonderful suggestions for our intown stay, and made several good recommendations. Please thank her for us. Becky’s pies were not to be missed, and they didn’t disappoint. Also, she left us a message in Portland regarding Symphony tickets there which we were able to purchase. She was the consummate professional. Every hotel would be well served by a concierge such as she, enthusiastic and knowledgeable. It was wonderful meeting you Gigi. Your suggestions were terrific! The overview of your beautiful city of Ashland brought us all to places and sights that we may never have experienced without your direction. Continue your beautiful work. It’s people like you who make our world a better place to live. Thank you so much for your professional and friendly help to make our Ashland weekend unexpectedly fun! The disappointment and inconvenience we experienced due to the Varsity Theatre’s film schedule error was put to rest by your efforts to secure us tickets at the Camelot to see a wonderful production of “I hate Hamlet”. We laughed so much and gained a new “must-do” theatre venue that will surely bring us to Ashland more often. And our dining at the Larks’ bar was perfect and delicious! Thanks too, for amusing us at 5:30pm with a spot in the restaurant. Thank you so much Gigi for all the great advice and tips about Ashland and the surrounding area. We had a great stay and look forward to seeing you again soon! You were born to be a Concierge with your sparkling personality! Thank you for being so helpful to us to explore the wineries! Our friends from California were impressed by your knowledge, as were we. They plan to see us next year in Ashland – Thanks to you!